I'm not gonna lie; I love weddings, I love receptions, I love love! I go to nearly every reception I'm invited and able to go to, because I always have so much fun at them. But the desire I have to have a reception, dinner, lunch, ect. is ALWAYS gone after I actually SEE someone planning a wedding. I remember how stressful it is, how time consuming it is, and how expensive it can be. Whenever this happens, I always say to myself, "Nope. Not doing this. I'll just have a temple ceremony with family and friends. No reception. Sounds good!" But again, I never remember this until I see the planning being done. Recently, I got invited to one of my good friend's wedding in St. George. I love my friend, I adore her fiance, and I love weddings, so I eagerly agreed! She arranged for me to stay at her families house that weekend. And so, I headed down to St. George the day before the wedding so I could attend the wedding dinner. The drive down was fun, even by myself, and I was excited. But then a thought crossed my mind. "I am literally going to know nobody by the bride and groom." "It's fine. It's fine! Just become friends with three people you can stick with the whole weekend." Four hours later, I rolled up to the family's house in my sweatshirt and jeans, and instantly felt how inappropriate that was for the weather. I could feel sweat formulating quickly, and my face began to flush slightly. The front door to the house was open, and various people ran in-and-out of it while holding decorations that could only be for the reception tomorrow. I approached the front door just as my friend's younger brother walked out of the door. I had never met him, but he looked enough like my friend and the pictures I had seen of him. "Hey - is your sister here?" I asked. "I have no idea. I just got here myself." he said. "So . . . can I just like . . . walk in?" I trotted into the house and began the search for my friend. No sooner after I had stepped into the house did I stumble slightly. I looked down to see . . . an oxygen tube. "Shoot," I muttered under my breath, and followed the tube to see my friend's grandfather standing in the kitchen. I did what I do best: I ran away from confrontation. Meaning, I ran to the basement and checked every room there. I didn't find my friend, but I DID manage to find the entrance to the back yard. Slowly, I walked outside and observed my surroundings. People were running around and organizing objects under a large tent. I stood there for a second, not really sure what to do. I didn't want to interrupt what they were doing just to simply introduce myself, but what else could I do? Stand there awkwardly until someone acknowledged me? Yeah. Yeah, that's probably what I'll do. Then, from behind me I heard a soft voice say, "Hello." I turned around to see a sweet grandmother sitting properly on a bench by the side of the house. AHA. I found one of the three friends I would be hanging out with this weekend. I trotted over and sat by her, and introduced myself. We began talking, and I knew we would be kindred spirits whether she liked it or not. . . . . mostly because she was the only one talking to me at the moment and I love old people. I asked if she knew where my friend was. "She'll be home any minute now. They're driving down from Provo today," the grandmother explained. What I didn't know was as I was talking to the grandmother, the rest of the relatives were glancing at me while they organized things. "I don't know. Maybe she came with the son." "Is it a girlfriend? Why didn't he tell me he had a girlfriend?" "Maybe he was keeping it a secret." Just then, the brother who I had talked to earlier, and who they thought I was dating, joined the group. "Hey - who's the redheaded chick?" he asked. "We thought she was with you!" "Nah, I just let her into the house!" I continued talking to the grandmother completely unaware as to what was going on. Then, an adorable dog came over to me. Aha! Friend number two! Well, actually, a back up friend. I love dogs even more than I love old people, so I eagerly began to pet it, when I heard someone say, "Oh no. He'll get hair all over you." I looked up to see who I could guess was an aunt or the mother of my friend. "I don't mind. I miss my own dog so . . ."
She introduced herself to me and said, "So you know my daughter?" "Yeah - we're friends. I met her after we both came home from our missions." "Okay. She should be here any minute." "Can I help with anything?" I said, though I said it too softly and the mom walked away. "Oh. . . awkward. . . "
"It's okay, dear. There wasn't much I could do so you can just sit here with me." "Great. I'm real good at sitting on benches and . . . stuff. . ."
Though no sooner after I said that did the grandmother rush over to the group to direct them, and the dog trotted away to another group. And so . . . I was left alone . . . on the bench. The next fifteen minutes consisted of me weirdly hovering by people, petting the dog, and exploring the house. Finally, my friend arrived with her fiance. She wrapped her arms around me and said, "Thank you so much for coming! Sorry we didn't get here earlier!" "Oh, mom! Wait a second!" She ran off and dutifully helped set up the rest of the decorations. I stood there, not really sure what to do with myself. It was getting to that awkward point where I was being more of a hinderance than a help. Within time, however, I was helping decorate the tables and chairs and getting everything set up for the reception the next day. Sweat was still formulating on my forehead, and I realized how thirsty I was. I asked my friend where I could get a drink of water. She smiled and showed me to the kitchen (where I once again tripped over the grandpa's oxygen tube), grabbed me a cup, and hurried off to the garage to grab something for the back yard. The water dispenser was way more forward than I thought, and it resulted in water being spilled down my leg, foot, and ALL over the floor. My first instinct was to do what I do best: Run away from conflict and problems. But grandma was there, and I wanted to be friends with her and impress her! So I knew I had to clean it up. Panicking, I set the cup down on the counter and glanced around the whole kitchen like a mad woman. I couldn't find the paper towels or extra towels. I was too embarrassed and shy at this point to ask the grandma and grandpa where they could be, and so I resulted in pulling off the beautiful, white, clean hand towel hanging on the oven to wipe off the floor. B) I turned the beautiful, white, clean hand towel black. Even more embarrassed, I put the now filthy towel back where I got it, and ran off. I honestly don't remember if I actually got a drink or not. The rest of the day mostly consisted of me helping out here and there, following my friend around like a puppy, and getting ready for the wedding dinner. As usual, there were assigned seats at the wedding dinner. I sat down, and within a few minutes, the table began to fill with people I was somewhat acquainted with. . . .
A kid I had gone on a blind date with way back in March. He asked me to pay and I just stared at him until he paid. I went in for a hug when he went in for a handshake. I still squirm inside when I think about that last moment. I was dying. DYING. I tried to hide behind my hair, look busy drinking my glass of water, or trying to talk to the girl next to me who was already engulfed in a conversation with the person next to her. "Wait. Maybe he doesn't remember me. I mean, it's been like, 8 months." So, I set down my cup, and didn't look directly at him, but tried to look open. "I've been good! How have you been?" We had a cordial conversation, but if we're being straight up here, I just felt like we were both trying REEEEAL hard to show that we DON'T hate each other despite that we went on a date and didn't talk for 8 months. And if I continue to be straight up here, I kind of had forgotten about this kid until this very moment. The rest of the dinner was fine, I continued to talk to grandma, and then I was off to the house once again. Everyone was in panic mode getting everything ready for tomorrow; the cake, the bouquets, the flower crowns, the speakers, ect. I stood on the side lines until things had settled down so I could know what needed help - but had to move once I realized I was standing right on grandpa's oxygen tube. I was put on assignment to help grandma (score!) and the sister complete the flower crowns. After twisting a few wires together, I soon realized that I was FAR more of a hindrance than a help in this situation, and I excused myself to bed. My foot caught on grandpa's oxygen tube once more, and as I stumbled and shook it off my foot I mumbled to myself, "I am going to accidentally kill this poor man." I was assigned to sleep in the younger sister's room, due to the fact that all the other guest rooms were taken. Of course I felt bad about this, but not bad enough to stop me from sleeping. I dreamed of my car exploding and not being able to make it to the wedding, my teeth rotting out so I looked terrible in the pictures, and family members dying so I couldn't go to the wedding. Needless to say, I was pretty exhausted by the time 6:30 rolled around, and I was woken up by a family member saying they were going to the temple pretty soon. Dazed and confused, I sat up and said, "I'll . . . drive . . . separately." And flopped back in bed. My slumber didn't last long . . . and didn't really start, for that matter, because this scenario repeated three more times. I gave up, got ready in close to twenty minutes, drove to Einstein Bagels, and got to the temple for the ceremony. Honestly it was one of THEE best ceremonies I have been to. It was so spiritual and my heart was so warm as I saw my two friends get sealed together for time and all eternity. The only disaster that took place was grandpa ALMOST fell, but he didn't! So we're good! The rest of the group waited outside for the bride and groom to come out of the temple. Meanwhile, the bridesmaids began to don their flower crowns on their heads. Now, I hate how flower crowns look on me. Some girls can pull them off real well. Me? Not in the slightest. However, I was a bridesmaid, and I was NOT gonna throw a hissy fit about this. Besides, we're our own worst critics, right? I'm SURE they didn't look as bad on me as I thought. I placed one on my head and it instantly fell down to the tip of my nose. "Oh come on." I muttered to myself, and messed with it once more. Again, the tip of my nose caught the flower crown just in time so that it didn't slide around my neck. I squeezed, rotated, and replaced the crown over and over again until it finally sat on my head properly. All I had to do was not move my neck too quickly. "I brought bobby pins!" 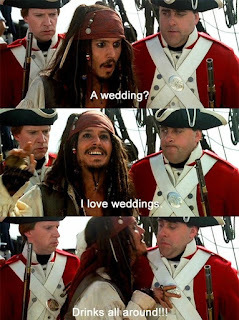 said one of the cousins to the bridesmaids. "I should be okay," I said. Of course, right after I said that, I moved my neck too fast and the crown fell to my nose again. I grabbed two bobby pins. As I attached them to the crown, I heard a voice say behind me, "Well. You look miserable." I turned to see the brother-in-law of the groom, who I had met last night at the wedding dinner. "Honestly I'm just exhausted. 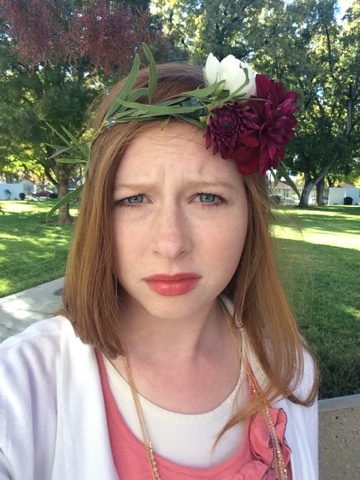 And I hate flower crowns." He glanced at his wife who was donning a flower crown on her own head and said, "There are many times when I'm grateful I'm not a woman." "Yeah," I scoffed, "Like you don't have to worry about labor." "I was just thinking along the lines of doing my hair, but you just jumped to the worst case scenario." "I'm really good at doing that." I said. The wife soon joined us. I patted my hair once and said, "How's it look?" "You've got a weird hair bump going on, but don't worry. I'll fix it." She fixed my hair and I chatted with them until the bride and groom came out of the temple. I coupled them together and dubbed them my second friend. Dozens of pictures and hours later, it was reception time! I was pumped for this. The reception set up was beautiful, and that had so many fun things planned. And so, after a dozen more pictures, I grabbed some pie, soup, and bread, and sat down at the table. No sooner after I had done this did the brother-in-law and sister join me. "So tell me," said the brother-in-law to me, "Before this reception, were the only people you knew the bride and groom?" "That's gotta be absolutely terrible," he said, "Those are usually the type of weddings I avoid." "It hasn't been THAT bad. First of all, I LOVE the bride and groom, and I LOVE weddings. And besides, I've gotten to know great people like you! And grandma!" "Still. 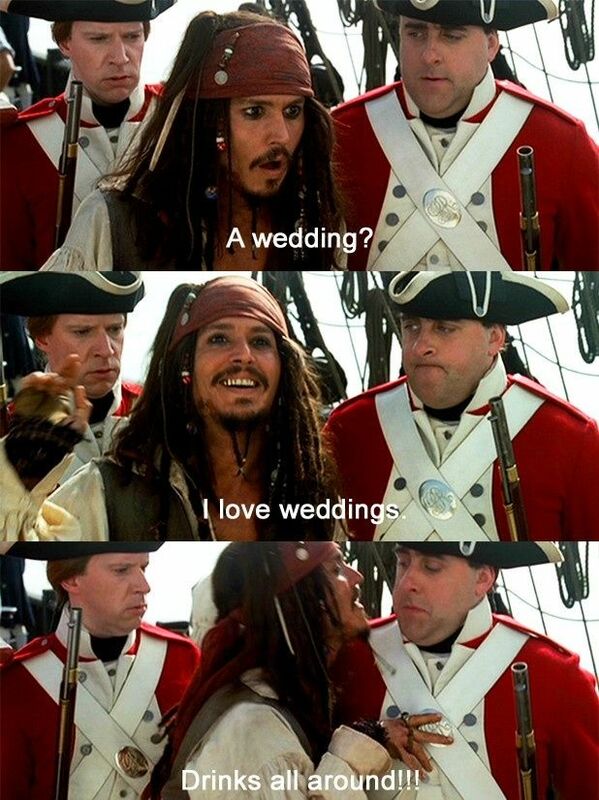 I run away from those weddings." he said, and I couldn't help but laugh. I danced with the two of them on the dance floor, and then later I saw grandma sitting by the fire place and joined her. We talked for about twenty minutes, and my friend (who knew that I wanted to become friends with her grandma) saw me, burst out laughing, and gave me the thumbs up. My time with grandma was cut short as she had to go upstairs to help organize food. I continued sitting by the fire when another couple joined me. I had sat by them at the wedding dinner, and talked with them at the wedding/earlier in the reception, so I had dubbed them friend number 3. No soon after they had joined me, did blind date kid come and sit by me. Blind date kid is a good guy. He really is. But I'll be straight up with you; I was NOT in the flirting mood at all. Nope. I mean, I can't even flirt, and besides, this was just weird. I doubted he would hit on me if we HADN'T gone on that blind date months ago. Did he feel bad he had never called me? Cause he really didn't need to. We were SOOOO awkward with each other. Just so not comfortable being in each others presence. Trust me, buddy, I had moved on. But hold up. Maybe he was just being nice. I might just be jumping to conclusions here. I had to test this. So, I excused myself to eat some s'mores. Yeah okay this was not a coincidence. Where was grandma when I needed her? AH! The younger sister! I dodged over to her. I made some sort of mindless comment to her, when suddenly, blind date kid popped up again. "Ooooh did you find a friend?" she said flirtatiously to me. And then . . . I ran to the dance floor. And he did NOT accompany me, because earlier he told me how much he hated dancing. After dancing, I finally decided to stop dodging him. That was just mean. And so, I went back to the fire place where he accompanied me, and we made really uncomfortable small talk the rest of the night. As we saw the bride and groom leave, I quickly said to the blind date, "Oh my. Look at the time. I've got to be off!" I hastily packed up my stuff, and realized I lost my cell phone charger. I left a thank you note, said goodbye to grandma because she was the closest one to me, tripped over and rolled my suitcase over grandpas oxygen cord on my way out, and had a brief goodbye with blind date kid who was waiting near my car. I drove to best buy to buy a new cord, and nearly fell asleep while the guy rang up my stuff. And I checked into a hotel. That's right, I checked into a hotel. And I promptly fell asleep, where I dreamed of bonfires, Alan Rickman being the blind date and kept following me around creepily, and more exploding cars. "[Awkwardness] is in your nature. You may want to begin on the path of accepting it."